Tax-Free Childcare is now open to parents of children under 12 years of age and registered/approved childcare providers need to have signed up BEFORE parents can use Tax-Free Childcare to pay their salary. Tax-Free Childcare will have a large financial impact on the family that you work for so this is an important process to work through. When applying for new roles, this will be a bonus for any family potentially considering employing you and may give you a head start over other candidates that they are considering. 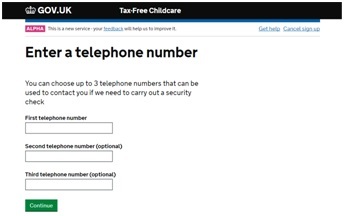 This is a guide to help you to sign-up with the Tax-Free Childcare scheme. 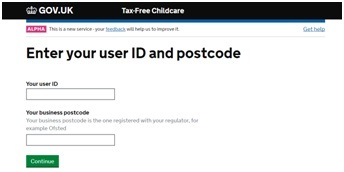 You must be registered with the childcare regulator (in England this is called Ofsted) before signing up with Tax-Free Childcare ‘and’ have a Tax-Free Childcare user ID. Your user ID will have been posted as a letter to your home address known by the childcare regulator. If you did not get your letter (perhaps as it went to an old address), call the helpline on 0300 123 4097 and they will check the address that they are using. 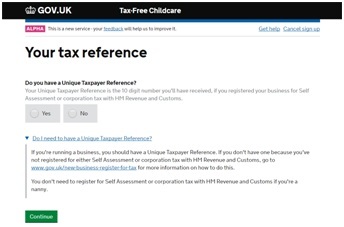 Tax-Free Childcare has an easy to use online sign-up system. 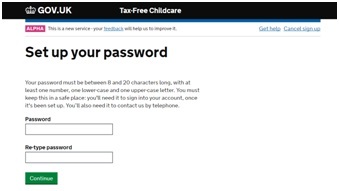 https://childcare.tax.service.gov.uk/ccp/signup/signupcode. Enter your user ID and postcode. Enter the ‘user ID’ and ‘postcode’ as it is shown on your invitation letter. Your business postcode is your home location. The system will lookup your details and ask you to confirm that they are correct. Do you have a Unique Taxpayer Reference? As a nanny you will not have a taxpayer reference unless you have previously or are currently also running your own business. Most nannies will select ‘No’. Enter your National Insurance number. Enter your business bank details. You do not need a business bank account. Enter the bank account details for where you wish to be paid by your employer. This will typically be your bank current account. Leave the ‘Roll Number’ field empty unless you bank with a building society and have a roll number. Check your bank details are correct otherwise someone else will get your pay! Do you want to nominate a delegate? A delegate is someone to assist you with using the online system. You should select ‘No’. If you are visually impaired and need assistance then you may have someone assisting you. Your password must be 8 to 20 characters and contain at least one number, one lower-case and one upper-case letter. The system will now take you through a process of setting security questions. When you login or phone the helpline, you will be asked for various details from your security questions to confirm that you are authorised to access your account. Tax-Free Childcare may need to contact you if they require further information or to carry out a security check. It would be advisable to enter two phone numbers so you can be contacted at work or at home, such as a mobile number and a landline. Your application will now be verified and your account created. Parents have one Tax-Free Childcare account per child. When a parent pays you, they will transfer payment to their Tax-Free Childcare Account and within three to four days your net pay will arrive in your nominated bank account. If they have more than one child you may receive several payments, this is absolutely normal. Each payment will have a reference to help you to identify for which child the payment relates. 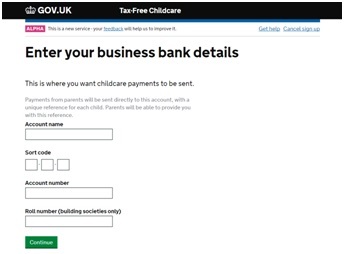 Parents may not be aware that there is a delay from when they transfer the money into their Tax-Free Childcare account and when you receive that money, so it may be helpful for you to let them know if your payments arrive late.